At its height during the 1920s, as many as 20,000 visitors came to Seal Beach and its “Joy Zone” each week, many if not most arriving on the Pacific Electric’s big Red Cars. Pier fishing and barge fishing were, of course, two of the main attractions of the pier itself. Fishing was considered good at the pier but when it slowed down anglers would simply switch to the angling found in the deeper waters by the barge. 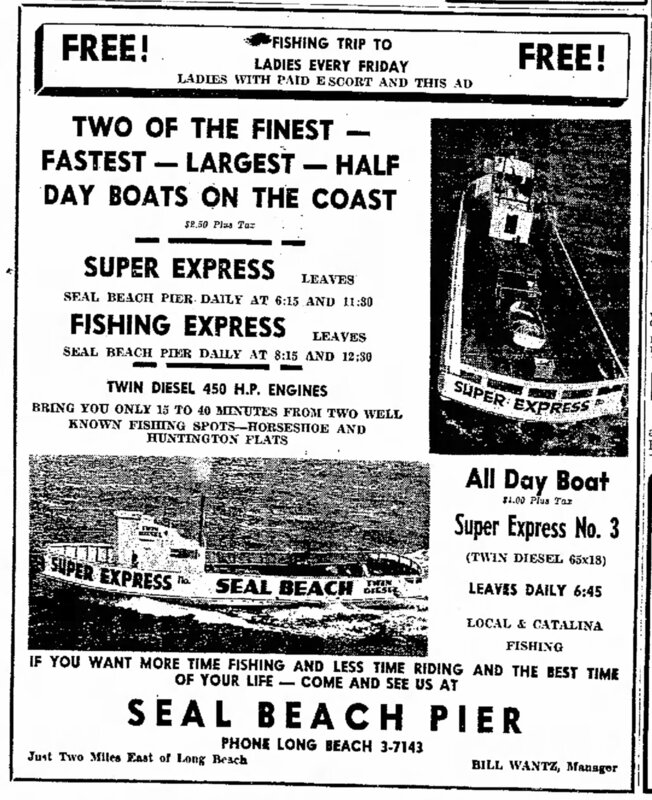 The first barge at Seal Beach, the James McKenna, began operating in 1925. Additional barges would begin operation in 1939, the F.S. Loop and the Homer. By the ’30s the city itself was well established but the affects and challenges of the Great Depression, including less discretionary money for amusement, would lead to the decline of the amusement area and its eventual closure in 1937. Although the joy in the “Joy Zone” would seem to have been at an end, the city itself seems to have developed quite a reputation for “sin”—including illegal “speakeasies,” gambling and prostitution. Apparently the area was still joyful for some. Meanwhile “Mother Nature” and simple old age would affect the pier. Although the pier survived the 1933 earthquake intact, two hurricanes had tremendous impact on the pier. In 1935 huge waves, caused in part by a hurricane in the Philippines, ripped into and partially destroyed the pier. The center portion was lost which left the outer end isolated. Although there would be a four-year closure, a new pier would emerge from the splintered remains. Collapse of a section of the privately owned Seal Beach pier Tuesday night, which marooned sixteen persons on the structure until Coast Guardsmen ferried them to a cutter, will result in hastening the construction of a municipal pier and breakwater closer to the entrance to Alamitos Bay, officials declared last night. The project, calling for an expenditure of $82,000, has been approved by Federal Public Works officials and plans have been completed. Plaques that sit near the front of the pier give evidence of the pier’s history and resiliency. One says, “Federal Emergency Administration of Public Works, 1938, Project No. Calif. 1723-F.” It represents the rebuilding necessitated by the storms and hurricane-related wave damage of 1935. Unfortunately, one year later would see California’s only recorded hurricane, the 1939 chubasco (sometimes called the Long Beach Tropical Storm “El Condonazo” or “The Lash of St. Francis”) moved up from Central America to Baja before hitting Southern California. The hurricane ripped the recently finished new pier in half but luckily this time the pier was quickly repaired, at a cost of $110,000. 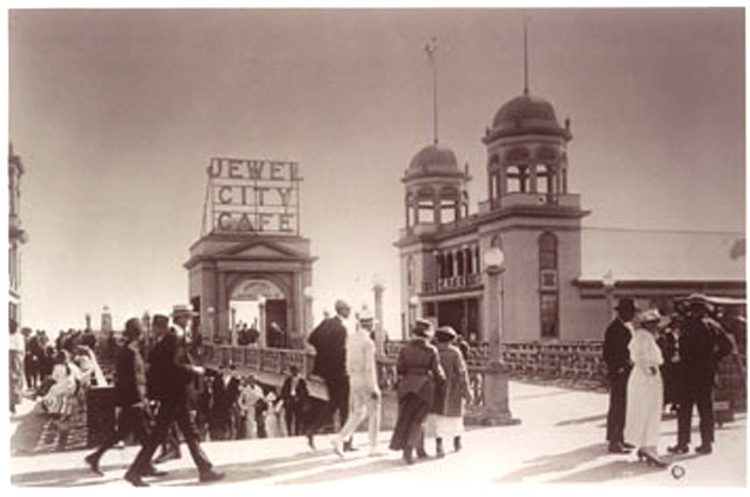 It was just a year later that the pier was reopened. These two repair projects, in 1935-38 and 1939, were just two of many to be seen at the pier—although more than 40 years would see relative peace. When open, the pier remained a well-used resource by many, especially fishermen. By the 1940s, and continuing for many years, anglers at the pier were offered the choice of pier fishing, fishing from barges, or fishing from live bait boats. Boat “Bearcat” Daily 3 A.M. — Boat “Lets Go” Daily 5 A.M. 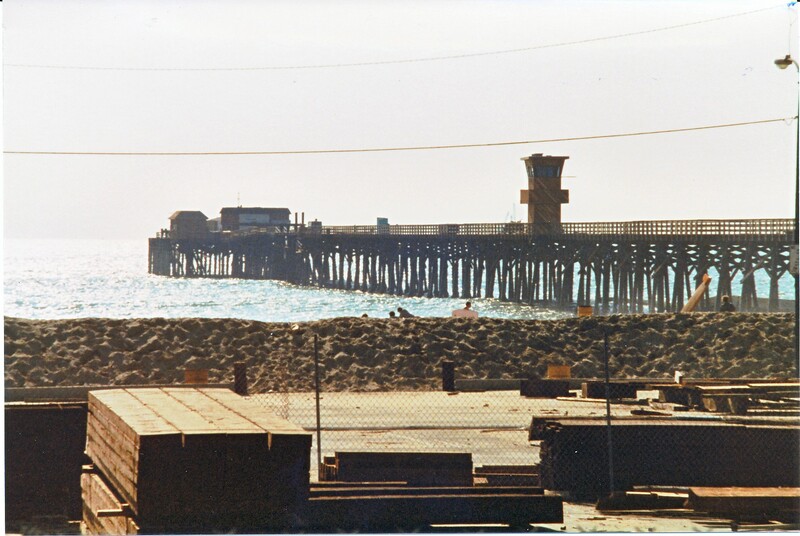 The killer storms spawned by the 1983 El Niño devastated many California piers and included Seal Beach as one of their victims. Two separate storms in January and March tore away several sections of the pier and initially many questioned if the pier would ever be rebuilt. No problemo! An energetic band of local citizens soon rallied around a rebuilding project. 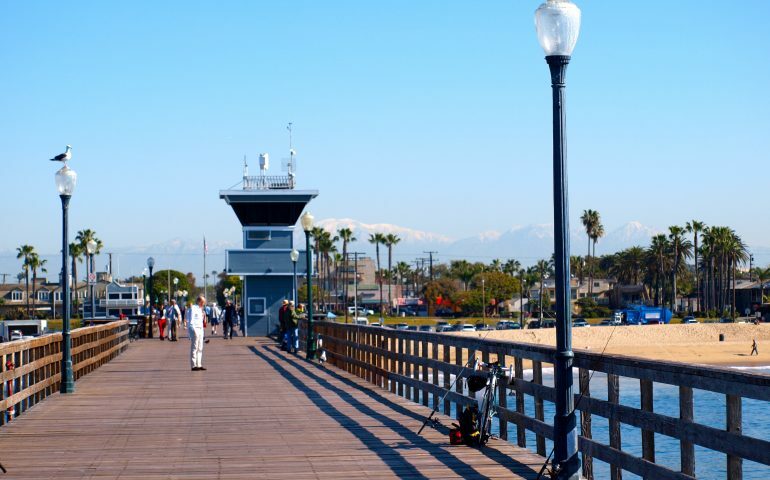 Forming a “Save Our Pier” group, the members raised money from both private and public sponsors and got their pier rebuilt, at a cost of $2.3 million. The pier reopened in September 1984. Today, plaques honoring Emily Frazier, Daisy Funk and Joyce Risner, the ladies who co-founded the group, as well as various other individuals, businesses and groups that contributed time and money to the effort, are visible on the pier. 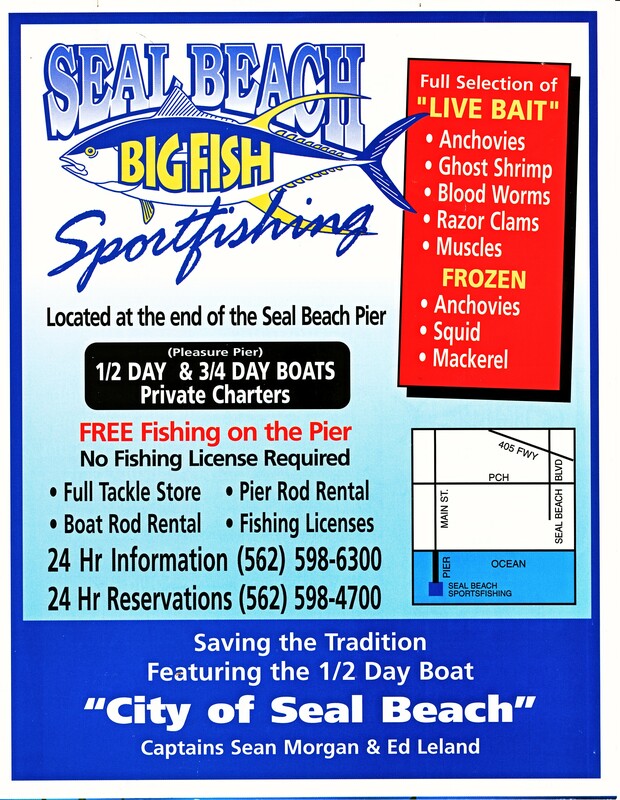 The reopening of the pier would also see the reopening of a Sportfishing landing on the pier — Big Fish Sportfishing. Eventually the pier would also become one of the home bases for one of California’s last fishing barges—the Annie B. 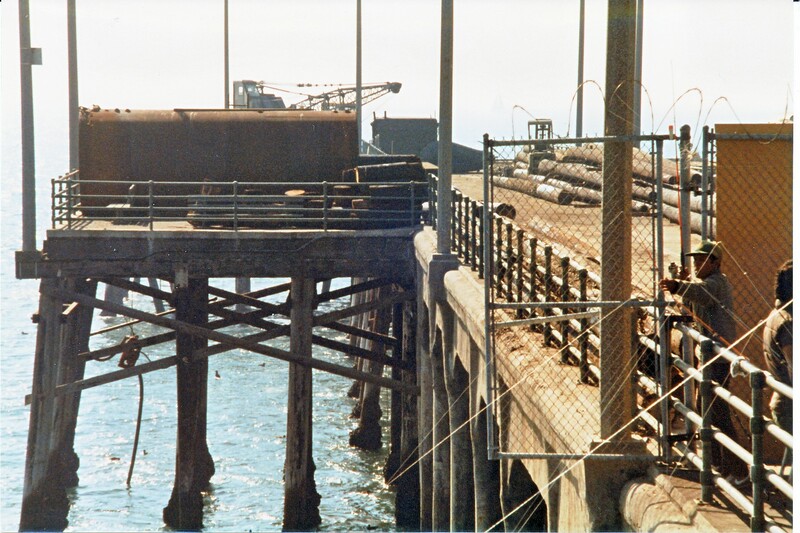 Used in conjunction with the landing at the Belmont Pier, and sitting inside the breakwater, the barge would provide low-cost fishing into the mid ’90s. Nevertheless, additional incidents have somewhat routinely closed the pier. On May 15, 1992, the week before Memorial Day, an electrical fire (which started in the lifeguard tower on the pier) destroyed 100 feet of the pier and the lifeguard station. Temporary measures were taken and the pier reopened a week later. A few months later, the Lander’s (or Big Bear) earthquake cracked some of the pier’s support pilings. Then, on May 21, 1994, falling barbecue coals ignited a natural gas line under the pier. The new blaze blocked the mid-pier section and trapped about 150 people out at the end of the pier. Although a few panicked, many simply continued to drink their coffee and finish their snacks out at Ruby’s Diner, and the majority just kept right on fishing, reeling in the mackerel, and listening to the radio tell about the fire at the pier as they watched the smoke bellow inshore from their position. All were soon evacuated.